The Ultra Lightweight is designed in Italy. 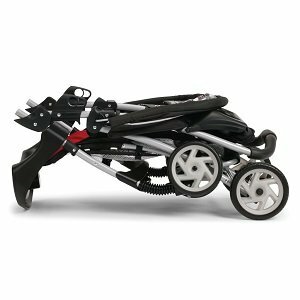 This has a rugged yet lightweight anodized aluminum frame that weighs only 11 pounds but comes loaded with features you would only expect to find on a full size stroller. Its 2 position reclining seat provides comfort and security with a padded 5 point harness and front wheel suspension. This comes with an adjustable and removable canopy which offers protection from the sun, wind and cold. Its large basket provides storage for all the things your baby needs. This comes with a quick release umbrella fold, stroller carry bag and shoulder carry strap which makes travel and storage convenient. Nano folds into its custom travel bag. Nano fits into airline carryon compartments. Nano is a complete travel system so no need to purchase extra accessories to fit your carseat. A truly lightweight, compact folding travel system that offers an authentic Mountain Buggy experience, nano provides dual functionality of car seat compatibility to easily transform into a fuss free urban stroller – perfect for today’s busy, traveling modern families. A stylish and innovative travel buggy, nano is a game changer for the world of nursery travel, and is going to strongly influence the direction of what a travel buggy should deliver. With its premium quality, refined style and strength of heritage, nano is a much welcomed addition to the Mountain Buggy range, offered to the customer as ‘first class travel in a satchel’. Weighing at just 13lbs and with the ability to compact fold into its own custom made travel bag that fits into overhead luggage compartments, nano can come on board with families who value ease and pure functionality. The sophistication of nano is that it also provides dual functionality to take your car seat with its built in car seat adaptors (no need to purchase extra accessories! ), and then perform as a super compact, urban stroller for years to come. Nano boasts a super quick unflick unfold PLUS an easy fold down system that locks it down to a travel bag size! A full size seat and sun canopy with flick out mesh sun visor, a handy shoulder strap for hands free transportation, and a well ventilated seat back when in recline are also perfect features for families on the go. nano is not a not a one trick pony, and promises all that you would expect from Mountain Buggy; the original all terrain premium brand. Travel system ready – no need to purchase adaptors! Travel light with this Kolcraft stroller that was designed for the mobility. The Kolcraft Cloud Plus has all of the features parents want from their everyday stroller, but in a compact, travel-friendly format. Lightweight – under 12 pounds! This rugged and compact stroller features all-terrain wheels and front suspension for a smooth ride. Convenient one-hand and self-standing fold. Both child tray and parent tray offer 2 cup holders. Large basket for storage. Three-tier extended canopy for maximum sun coverage and peek-a-boo window. Multi-position seat accommodates child to 50 pound and offers 5-point safety restraint system. Folded: 18″ w x 12″ d x 34″ h. One year manufacturer warranty. JPMA Certified. This umbrella stroller with a secure three-point harness features a variety of fun fashions and packs easily for a trip to the park. City life, always bustling, living quarters are small, travel is smaller, and being quick is the only option. We all know that children are not notoriously fast, they are curious and not always in the mood to follow instruction. You need a stroller that will be a nimble companion and help you keep everything under control. Joovy’s new and improved Groove Ultralight premium umbrella stroller is your solution. Weighing in at a mere 12.78 pounds, this lightweight stroller is 5 pounds lighter than its already agile sibling. Additionally, the Groove Ultralight offers a multi-position reclining seat, a large storage basket so none of your belongings get left behind, and Joovy signature oversized canopy. No compromise required; comfort, contemporary style and quality are included with every purchase and a smile from mother and baby is guaranteed. This Cosco umbrella stroller with canopy and a secure three point harness includes a variety of fun features, fashionable styling and packs easily for a trip to the park. You’ll have it made in the shade with the Umbria stroller to get you and your child where ever you need to go. It has a lightweight frame that folds down quickly and, at just 11 pounds, it’s easy to lift in and out of your car. This great-for-travel stroller also includes a large canopy and other convenience features you want along for the ride. 3 point harness, 2 position recline, Mesh parent tray, Child tray with center cup holder, Easy access storage basket, 4.5″ front and rear wheels, For use with children up to 40 pounds. This lightweight stroller is compatible with all Graco Classic Connect infant car seats, so you can create a custom travel system. The stroller is simple to fold – fold it with one hand! Graco’s LiteRider stroller is compatible with all Graco Classic Connect infant car seats, so that parents can create their own custom travel system. The LiteRider Classic Connect Stroller is ultra-lightweight, yet sturdy, and designed for the active family. It weighs only 17 lbs. (approximately), so it’s always easy to maneuver. This stroller is designed to hold a child up to 40 pounds—and up to the top recommended weight of any compatible Graco Classic Connect infant car seat—for years of comfortable strolling. It’s easy to find just the right position for your child to stroll comfortably, thanks to the 2-position reclining seat. 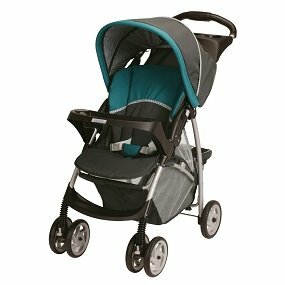 The soft fabrics and padded seat add to the comfort of this terrific stroller. The LiteRider Classic Connect Stroller features a super-simple one-hand fold. That way, your other hand is always free to hold or carry your little one! The lockable front-swivel wheels and durable built-in suspension make the LiteRider Classic Connect Stroller easy to maneuver just about anywhere. The LiteRider was built with parents’ convenience in mind, with an extra-large, drop-down storage basket (so that you can reach in for the item you need, without disturbing your child), two deep cup holders and a parent’s tray with storage. So, it’s easy to have everything you need—water bottles, keys and diaper bag—all within arm’s reach. Parents also love the removable child’s tray, which gives your little one his or her own tray, but removes to allow for easy stroller entry and exit. Babies like to be in style, and the stylish Dragonfly fashion is just right for little girls and boys. 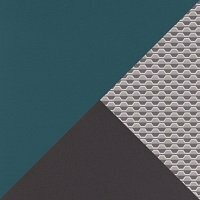 Teal and dusty cocoa solids are offset by a mesmerizing pattern of variegated hexagons, setting your little one on a very chic path. You’ll enjoy this stroller for years, since it accommodates a child up to 40 lbs. Accommodates a child up to 40 lbs. The stylish Dragonfly fashion is gender-neutral. Lightweight stroller weighs less than 20 pounds. Folds quickly and easily with just one hand. Use with all Graco infant Classic Connect car seats. 2-position reclining seat helps keep baby comfortable. Stroller holds child up to 40 pounds for years of comfortable strolling. Parents also love the removable child’s tray, which gives your little one his or her own tray, but removes to allow for easy stroller entry and exit. Extra-large storage basket and parent’s tray offer additional convenience. The G-Lite is sure to become your most indispensable “accessory”. With a removable seat pad and Stain Defend fabrics, the lightweight and compact G-Lite is perfect for quick trips or anywhere space is limited. You’ll have it made in the shade with the umbria stroller to get you and your child wherever you need to go. It has a lightweight frame that folds down quickly and, at just 11 pounds, it’s easy to lift in and out of your car. This great-for-travel stroller also includes a large canopy and other convenience features you want along for the ride. The First Years Ignite Stroller is easier for you, more comfortable for your baby. Finally a stroller that is durable and, yes, it really will comfortably fit your little one up to 50 pounds. 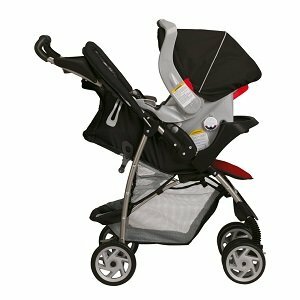 The ignite features today’s popular euro styled frame combined with our contemporary fashions deliver a stroller that you will love to use. The wider seat base means a more comfortable ride for your child, which will keep them in their seat longer. The larger wheels (6″ diameter), all eight of them, allows your stroller to glide over any surface. Worried about keeping your little one in their seat? The addition of the five point harness means your little one is securely seated. And for you, the taller handles mean no more hitting the back side of the stroller or the wheels while you go for that afternoon walk or trip to the mall. Sunny day no worries, the fully adjustable and removable (for those cloudy days) canopy means you’re little one will always ride in the comfort of shade. And if your little one starts to nod off during your long afternoon walk, simply use the recline feature and they can comfortably snooze while you continue on your way. The large upper storage console for you means your water bottle; your keys, your wallet and more are easy to access as you are out and about. And the underneath storage provides plenty of room for your diaper bag and any other extras you bring or buy along the way. And when you stop along the way, the rear wheel brakes (we also added front wheel swivel locks) will allow the stroller to stay in place. The ignite stroller features an easy one hand fold and weighs only 14 pounds, so it is easy to toss in your trunk in between trips. The Right fit for a Keyfit. Designed exclusively for the rated Keyfit Infant Car Seat, the Keyfit Caddy is a perfect addition to a Chicco baby gear collection. Featuring the easy and secure click in car seat attachment you’ve come to expect from Chicco, this lightweight car seat carrier was created specifically for Cortina Travel System parents looking for an extra convenient way to travel with baby on those especially busy days. With its light aluminum frame, compact one hand fold, large expandable basket and 4 position height adjustable handle, easy to see how the Keyfit Caddy can simplify life during baby’s first months. Other features include all wheel suspension, toe tap locking brakes and a full featured parent tray. 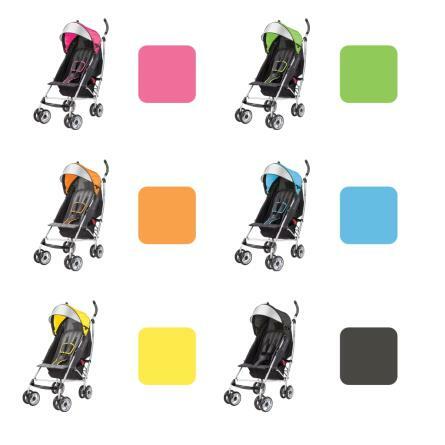 The First Years Jet Stroller-Easier for You, More Comfortable for your Baby. Finally a stroller that is durable and, yes, it really will comfortably fit your little one up to 50 pounds. The wider seat base means a more comfortable ride for your child, which will keep them in their seat longer. The larger wheels (6″ diameter), all eight of them, allows your Jet stroller to glide over any surface. Worried about keeping your little one in their seat? The addition of the five point harness means your little one is securely seated. And for you, the taller handles mean no more hitting the back side of the stroller or the wheels while you go for that afternoon walk or trip to the mall. Sunny day-no worries, the fully adjustable and removable (for those cloudy days) canopy means your little one will always ride in the comfort of shade. And if your little one starts to nod off during your long afternoon walk, simply use the recline feature and they can comfortably snooze while you continue on your way. The large upper storage console for you means your water bottle, your keys, your wallet and more are easy to access as you are out and about. And the underneath storage provides plenty of room for your diaper bag and any other “extras” you bring or buy along the way. And when you stop along the way, the rear wheel brakes will allow the stroller to stay in place. The Jet stroller features an easy one hand fold and weighs only 11 pounds, so it is easy to toss in your trunk in between trips. Go anywhere and everywhere with this portable and easy to fold stroller. The Jeep Cherokee offers all the features you want without sacrificing. Lightweight – under 12 pounds! 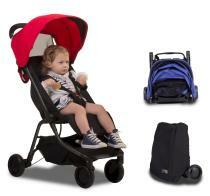 This rugged and compact stroller features shock absorbing, all terrain wheels. Convenient one-hand and self-standing fold. Both child tray and parent tray offer 2 cup holders. Large basket for storage. Three-tier extended canopy for maximum sun coverage and peek-a-boo window. Multi-position seat accommodates child to 50 pound and offers 5-point safety restraint system. Folded: 18″ w x 12″ d x 34″ h. One year manufacturer warranty. JPMA Certified. An ideal stroller for the active parent and baby.